Median = (a+b) / 2. 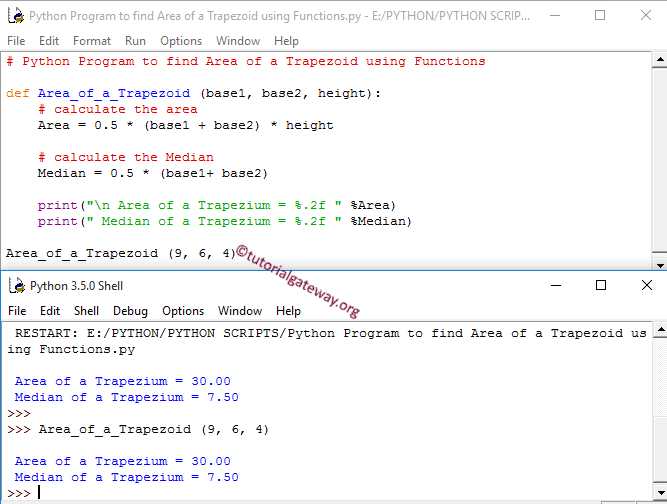 This python program allows the user to enter both sides of the Trapezoid and height. Using those values we will calculate the Area of a trapezoid and Median of a Trapezoid. This program allows the user to enter the base1, base2 and height of a Trapezoid. We will pass those values to the function arguments to calculate the area of a Trapeziod. First, We defined the function with three arguments using def keyword. It means, User will enter the base1, base2 and height of a Trapezoid. Next, We are Calculating the Median and Area of a Trapezoid as we described in our first example.